Lewis has just moved to Denmark to start his study abroad Semester at Aarhus University as part of his English Language and Literature degree at Reading. Just a week or so in, read on to find out how he’s getting on! Aarhus has recently been declared the cultural capital of Europe, and this is evident in the mass portrayal and acceptance of many different countries cuisine. This is apparent in the Aarhus “street food” market which contains all different types of food, ranging from ‘Jamaican Jerk Chicken’, ‘Mexican Burritos’, ‘Chinese Duck’, curries and French Crepes. This is a really wide variety of food that shows the wealth of culture present in Aarhus. But to top off this creativity the whole market is built inside an un-used bus station. The stalls themselves are built and set up inside old ship yard containers. This means the theme of the Aarhus “street food” market is to not only re-cycle but to re-use old things and provide back for the public. The food as well was really cheap about 30 krona which exchanges to roughly £3.00. This makes it an ideal place for a student to grab a quick and easy lunch and when you are done, you have to wipe your own table with the disinfectant and towels dotted around the seating area. 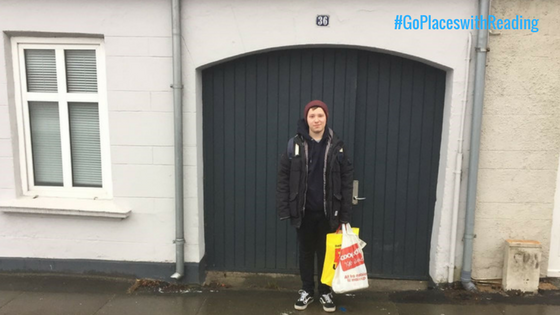 This is me outside my house in Denmark, the houses here have a cottage feel as they are small and are packed with essentials from the university such as pans, plates, cutlery to chopping boards and cups. I did not need to buy anything apart from food as it was all provided by the University! It’s not as cold as you think it is here, all though many will disagree but if you come prepared like I did by bringing a thermal coat, hat and scarf you can easily survive the cold weather. There are many nationalities that come to Aarhus to study but in my house I have 2 Canadians, one Australian and one American. So the university put me with fellow English speaker which made it easier to talk and joke with each other. My lectures at the university were not what I was expecting. I thought I would be in a class of all international students, and this belief was further enforced by the fact my lecture was in English, so I assumed the class of 24 students in my literature course had different nationalities and they were learning in the common language of English. So when I got put in a group I asked them if they were German as I heard them speaking to each other. They looked at me shocked and one of them said “no, we are Danish”. I was, and still am, shocked to learn that I was in a Danish majority English Literature class, with only 4 other international students. The fact the students were all conversing with the lecturer in English for an English literature module shows the high level of language skills many of the Danish actually possess. This is a short blog of my time so far in Denmark, I have only been here for one week but I have already learnt so much about the culture of Denmark and its history. I expect I will learn much more in my weeks to come. 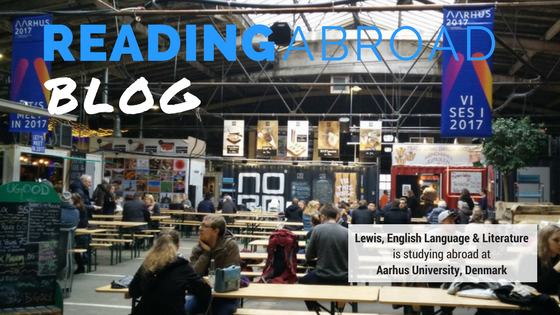 This entry was posted in Denmark Study Abroad and tagged 2016/7, Aarhus, Denmark, English Language, English Literature, Erasmus, Europe, Joint Degree, Study Abroad. Bookmark the permalink.